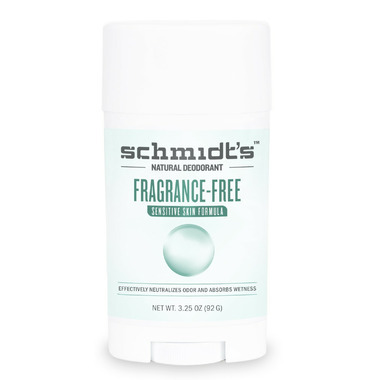 Schmidt's Deodorant Fragrance-Free Sensitive Skin Deodorant is neutral and gently formulated; a must-have for those seeking effective sensitive skin protection and a luxurious experience without scent. Directions: Apply gently to underarms as needed. Do not overapply. Gave this a try because I have very sensitive pits and scents bother me as well. On the positive side it didn't cause any irritation or rash, but it just didn't work. It worked well for approx 2 weeks then my body got used to it and I started to stink again. I also wasn't a fan of the texture and whiteness. I tried the rose scented schmidt and loved it but i thought i would try the unscented because i try to be sensitive to other peoples allergies. Terrible... at the end of the day i swear i smell worse than i ever have. And if i reapply at any point, it takes the smell of my sweat and i have to scrap off the top 2 layers. This product has changed my life. Less worry. Less laundry. And no irritation. I decided to try this version so that I could exercise without the strong floral/citrusy scents from the other Schmidt's products. Although I love the feel and easy application, I found that it did not hold up to prevent perspiration after a good workout, unlike scented version in the jar which worked really well. I like it as an everyday product when I'm not exerting myself but wouldn't recommend if you're looking to exercise and really sweat! I absolutely love it!!! I've tried most if not all the vegan/clean deodorants out there and this Schmidt's Deodorant Fragrance-Free for Sensitive Skin Deodorant is the ONLY one that has not eventually given me some sort of irritation under my pits. I strongly recommend it for anyone with very sensitive skin in that area. Not the greatest deodorant, only works when not active. I've used Schmidt's jar deodorant before and liked it. Tried the stick for easier application. It is easier to apply and very smooth, but so slick and sticky it's like putting honey on your armpits. Also found the odour control was not as strong as the jar formula. Would therefore recommend the jar formula and not this stick (perhaps the different scents feel and work differently). Schmidt's is one of my favorite natural deorderant brands. This fragrance free sensitive skin option dose everything I want it to do. I love the bergamot lime, but this formula is smoother. I would totally purchase this again.